SLUG Magazine is looking for a new, part-time employee to join our distribution team, immediately! If you are interested in applying for this position please send your resume to jobs@slugmag.com; Attn: Angela H. Brown. Please, no phone calls. 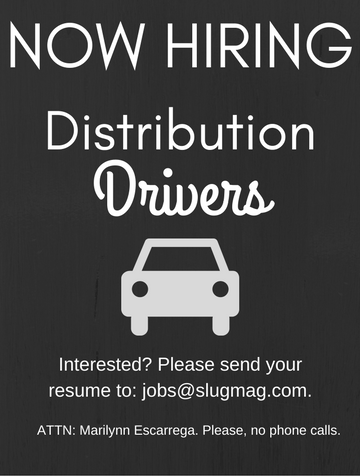 SLUG Magazine is looking to build our distribution team. SLUG Mag Delivery Drivers are part-time employees who work once a month to deliver the current issue of SLUG Magazine in Salt Lake City and its surrounding areas. Opportunities for additional routes are frequently available throughout the month.